The Great Festival Temple of Thutmose III (5) lies beyond the ruins to the east of the sanctuary. It was built in honour of Amon-Ra by the pharaoh who fought no less than seventeen battles during his reign, creating a vast empire for his country. In his thanks for victory, Thutmose III ordered the erection of this spacious and elegant temple 44 metres wide and 16 metres deep. The roof of the temple was supported by twenty columns in two rows with unusual inverted calyx capitals an artistic innovation that was never repeated - and thirty-two shorter, square pillars on the sides. The reliefs depict Thutmose making offerings to the gods. Grouped around the sanctuary, which comprises three sections, were some fifty halls and chambers. 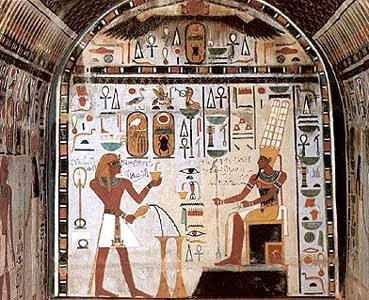 One of them (to the left) has four clustered papyrus columns and unusual reliefs on the lower walls. They show different animals and exotic plants that the conqueror brought back to his country from Syria in the 25th year of his reign. Southern Buildings (see Plan No. 10, page 66) This area is approached from the Central Court (between P.3 and P.4). The first court (6) was the site of the famous Karnak Cachette. It appears that periodically, either for political or religious reasons, or to protect them in times of threat, the priests removed objects that had been dedicated and because of their having been consecrated, buried them in sacred ground. In the Karnak Cachette thousands of objects were unearthed in 1904: stone sculptures, sphinxes and statues of sacred animals, as well as smaller items in metal and stone. There were 47,000 bronze items alone. The doorway to the east leads to the Sacred Lake (7) where the priests of Amon purified themselves and conducted religious rites. Lying on the left-hand side of the path is the upper part of the obelisk ofHatshepsut, which enables us to view the fine technique of relief carving on granite. In the sunlight it can be seen that the figure and name of Amon were chiselled out (in a scene where Hatshepsut is being crowned) and were later recarved. The huge granite scarab, associated with the Sun-god in the form ofKheper, was dedicated to the rising sun by Amenhotep III. It was taken from his mortuary temple in the necropolis, as were many of the blocks, which were reused. Thutmose III erected the Seventh Pylon (P.7), and Hatshepsut the Eighth (P.8). The Ninth and Tenth Pylons (P.9 and P. 10) were built by Tutankhamon and Haremhab. 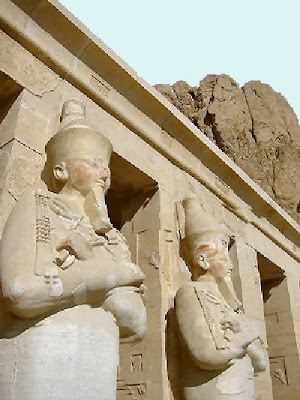 As already mentioned these two latter pylons were found to be filled with talataat from the sun temples of Akhenaten. The word, which means ‘three’ in Arabic, was coined by workmen because the size of each block measured three hands’ width. The total number that have been found in the Karnak complex, beneath the flag-stones of the Hypostyle Hall, in the Second Pylon, and in the Ninth and Tenth Pylons, numbers over 40,000. The eastern avenue of sphinxes extends from the 10th Pylon to the Temple of Mut, consort of Amon, which is now being excavated and reconstructed. 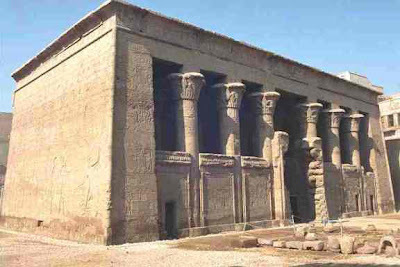 To the west of the Southern Buildings are the temple of Khonsu (8) and the adjoining temple of Osiris and Opet (9), which was built in the Ptolemaic Period.